To minimize drill bending and maximize hole accuracy, mount drill bushings as close to the work piece as possible while still allowing adequate chip clearance. The necessary clearance depends on work piece material and chip stringiness. For example, cast iron, with fine chips requires about 1/2 times drill diameter for chip clearance. Materials that produce long, stringy chips, such as cold-rolled steel and aluminum, require at least one-drill-diameter clearance. To reduce clearance even with long, stringy chips, exit-end chip breakers are available. Direct workpiece contact is usually not recommended. Chips can escape only up through the drill’s flutes, drill-bearing length is shortened by the drill point’s length, and drill-withdrawal burrs can raise the jig plate. Direct contact may be necessary, though, for maximum bearing length when drilling sloped surfaces (see below). Also, reamer bushings can be mounted much closer than drill bushings, due to much finer chips, for more-accurate hole finishing. To avoid jig-plate or bushing distortion, do not use excessive interference fits on press-fit bushings. 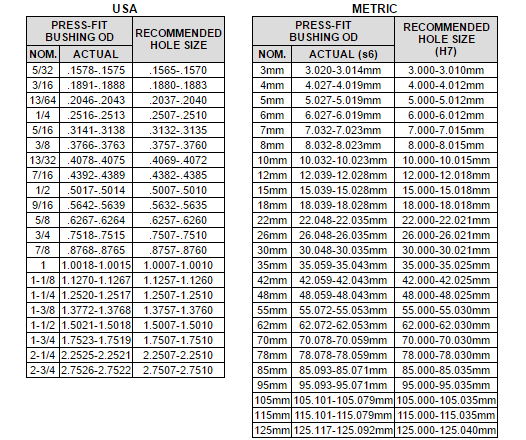 See table below for recommended hole sizes in unhardened steel or cast iron jig plates. Always prepare installation holes using a jig borer or reamer. Standard chucking reamers (with a plus tolerance) usually produce installation holes to the tolerances shown in the table. Other factors to consider are: (1) headed bushings require less interference to resist drilling thrust; (2) longer bushings in thick plates require less interference; (3) bushings with thinner walls are more prone to distortion; (4) less-ductile jig-plate materials require less interference. We recommend installing bushings with an arbor press whenever possible. If the bushing’s OD is large enough, you can also use a drawbolt with two washers as shown above. If a hammer is the only tool available, do not strike the bushing directly or it could fracture. Use a soft-metal punch to cushion the blows. Before installing a press-fit bushing, lubricate the inside of the mounting hole and outside of the bushing with a lubricant such as lithium grease. Otherwise the bushing may score the mounting hole, and may be difficult to replace later. Long bushings with small IDs are slightly counterbored for proper drill-bearing length and chip clearance, as specified by ANSI standards. Counterbores prevent binding and heat buildup due to excessive bearing length. See Counterbore Data charts for ANSI counterbore depths. Counterbore diameters are generally 1/32 inch larger than the inside diameter, and are angled at the bottom for smooth entrance. No-counterbore bushings are available on request as specials.